WASHINGTON—Gov. Jay Inslee of Washington State spoke at Conrad Hotel Wednesday, calling Rep. Alexandria Ocasio-Cortez’s Green New Deal a “helpful” step in the climate change revolution. Inslee told Wetstone that the U.S. needs to make climate change the number one priority, and that bills like the Green New Deal help shape that view for Americans. “I think the Green New Deal has been helpful in that effort in several ways,” Inslee answered. “Number one, it’s got people talking about climate change…Second, it has lifted people’s level of ambition…Third, it’s brought in so many new communities for discussion,” which he said includes people of color. Inslee told attendees that he knew many people were concerned about the details of the bill, but he believes the road to completely clean energy is feasible. The governor showed lots of support for the Green New Deal two weeks prior on The View, when co-host Meghan McCain asked how the bill will affect Americans with its $51 trillion cost, removal of planes, cows and railways. “It doesn’t seem that rational to me,” McCain said. Inslee made the same comment about his car at the ACONE panel. “I got in an argument with someone on The View, which shall remain nameless,” Inslee said drawing laughter from the audience. Near the end of 2018, the U.S. sold one million plug-in electric cars, a fact that Inslee proudly shared at the panel. Over one million electric cars filled the streets in Europe the same year. But the Yale Environment 360 wrote that, “EVs still only accounted for 2 percent of all new car, van, and light truck sales in Europe.” And in the U.S., it took eight years for brands such as Tesla, General Motors, Nissan and Ford to reach their milestone of sold cars. The starting price of a 2019 Chevrolet Bolt EV is at $36,620, while a 2018 model starts at $37,495. Those prices are just above the average cost of a car back in 2017, according to Bankrate, but most Americans can’t afford to buy a new vehicle at those prices. Though the EV industry is progressing at a slow pace, there is a rise in the renewable energy industry. In the U.S., California and Texas are leading other states in clean jobs. They currently hold 513,000 and 233,000 jobs respectively. In 2018, metropolitan areas like Chicago, Miami and Seattle saw double-digit percentage increases in solar energy jobs. 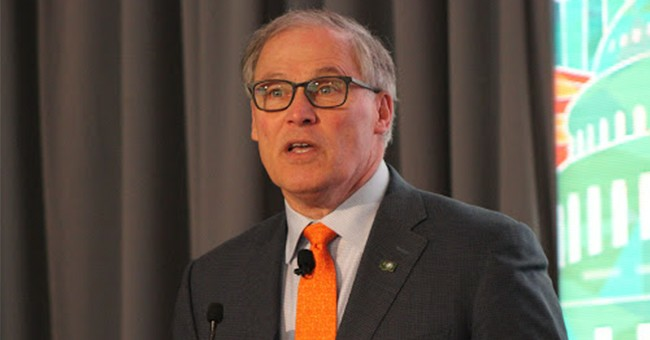 Inslee argued that the capitalist system can play a part in pioneering cleaner energy, but The Heritage Foundation said that some legislators favored intervening in the economy. Inslee could also seem hypocritical in his support for the Green New Deal, as American Enterprise Institute resident fellow Alex Brill said that the bill would hurt green economic innovation. If Inslee becomes the next president of the United States, he could end up walking a political tightrope, in which he might be pressured to fall either on the side of political intervention or economic progress. He could be forced to make a decision quickly if we are on the brink of destruction due to climate change like he suggests. “We are the first generation to feel the sting of climate change and we are the last generation who can do something about it,” he said at the panel, echoing his campaign video.